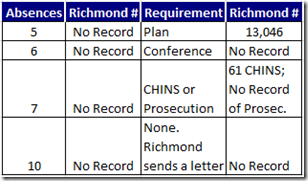 7 unexcused absences: Prosecution of the Parents or CHINS petition v. the student. 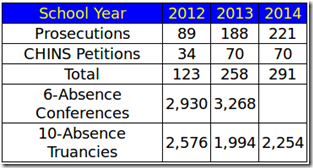 So this year they are not even keeping records, except to show an appalling number of five-absence cases and that the unlawfully minuscule number of CHINS petitions has dropped. 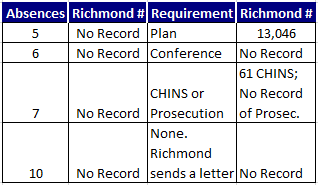 You might think that VDOE, which has the duty to “see that the [mandatory attendance laws] are properly enforced throughout the Commonwealth” would be doing something about this tragic defiance of the law. But to think that you’d have to be unaware of VDOE’s ongoing disdain for performing that duty. What I don’t understand is why somebody doesn’t mandamus the School Board. Or sue them for damages (e.g., for a death by stabbing) caused by a frequent truant.